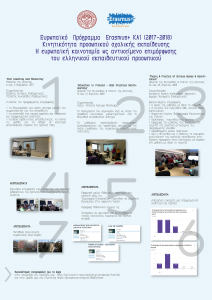 The school teachers who participated in the Erasmus+ KA1 project entitled «The European innovation as a training subject for the Greek teaching staff» presented the project and its learning outcomes in the Best Practices Dissemination Event of Evangeli Model School of Smyrna in the form of a poster. The event, which was open to the public, was held in the school premises on Sunday 7/10/2018, at 17:00-20:00. We attach the poster in the Greek language.